WHEN football crowds roar, radio listeners now hear them in their loudspeakers, not as a muffled, distant murmur but as clearly and faithfully as though sitting in the grandstand. When a broadcast is made of a political meeting or any other public assemblage, every speaker on the floor of the hall is heard by the radio public as distinctly as are the platform orators. No need for long-winded announcers to cut in; the man sitting at home beside his radio set often can hear more than the occupants of the expensive ringside seats. Startling recent improvements in microphones, the electric ears that represent you wherever anything of importance is happening, have made this possible. Latest styles in mikes, ranging from a tiny black button an inch and a half in diameter to a huge bowl five feet wide, have forced old-line technicians to revise their ideas of what can be put on the air, ideas they had acquired because of the limitations of the microphones with which they were obliged to work. The midget of them all—a curious little instrument known as the lapel, or buttonhole, microphone—has made over broadcasting methods. Some months ago, New York engineers of a great electric company were called upon to solve a problem for public speakers. Lecturers disliked standing in front of a fixed microphone. They wanted to be free to move about the platform without interrupting their discourse. The engineers’ answer was a “buttonhole” microphone to be worn in the speaker’s coat lapel. Wherever he turned, the button picked up his voice and a small trailing wire carried it across the floor to the amplifiers and loudspeakers. Broadcasting directors were quick to grasp the possibilities of the midget mike. A rush order brought a supply of them to Chicago on the eve of the Democratic National Convention last summer. Microphone circuits from the rear of the hall were carried along the roof and dropped at six points in the convention hall. At each of these stations, a page boy held a lapel microphone connected to a circuit, and a chart showing the location of each of the state delegations. When the vote of a certain state was called for, the nearest page boy hurried to the leader of the delegation and clipped the microphone on his lapel. He then announced the vote of his state in an ordinary voice, which was heard from coast to coast. Often the radio audience heard the vote before the chairman of the convention, who was sitting right in the hall, heard it. Since that successful experiment, uses for the lapel microphone have multiplied. An announcer appeared at a recent football game with a pair of binoculars wired for sound. A lapel microphone mounted beneath the lenses enabled him to describe the play without taking his eyes from the players on the field. Actors and actresses donned lapel microphones not long ago to add realism to a radio drama. Reading their lines from prepared scripts, they were able to move freely about the studio. It is apparent, the little black button has almost infinite possibilities for it can go wherever its wearer takes it. In one recent experiment, a noted woman swimmer broadcast her sensations from an aquaplane behind a speeding motorboat, speaking into a lapel microphone that was fastened to the shoulder-strap of her bathing suit, ready to catch everything she said. Today, however, a microphone can remain in one place and still pick up the voices of distant speakers. 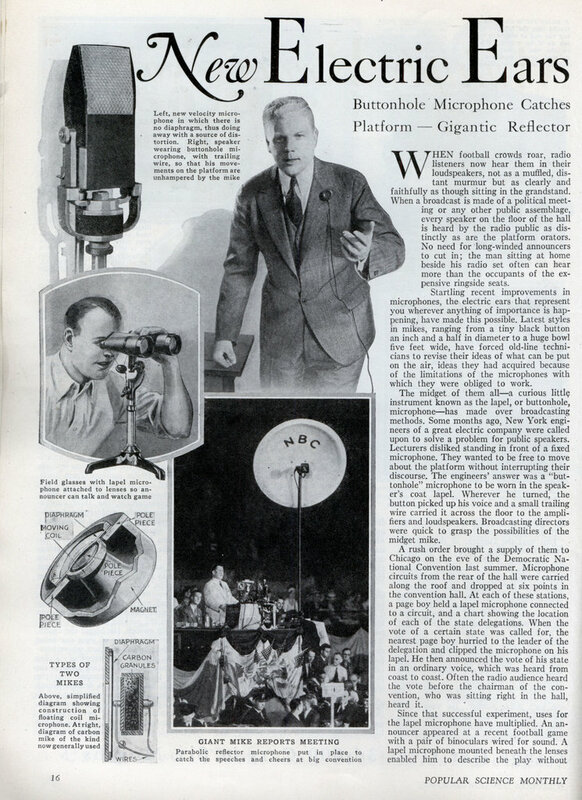 Recently perfected for broadcast use is a “parabolic reflector microphone.” In it the microphone proper is built into a huge bowl-shaped reflector that focuses the sound upon it. Like a searchlight, the reflector may be swung in any direction and aimed at the center of interest. Crowd noises and band music at football games are now picked up by the parabolic microphone—a more satisfactory and flexible method than the former one of stringing half a dozen or more standard microphones around the field and cutting them in or out as desired. Operas have also been broadcast with the aid of the parabolic mike, which gives a better blending of instruments since it may be placed at a distance from the musicians. Two of the largest parabolic microphones ever built, each five feet in diameter, were used at the Democratic convention by one broadcasting chain. A special concrete mold, weighing half a ton and shaped like a bird bath, served as a form for their construction. New Fidelity claimed for the “moving coil microphone” and the “velocity microphone”—both fresh from the laboratory. They operate like dynamic loudspeakers in reverse; the moving element, vibrated by sound waves in a magnetic field, generates electric current that reproduces the sound. The velocity microphone is remarkable in that it has no diaphragm, thus disposing of a source of possible distortion in the “carbon-grain” and “condenser” types in general use. Meanwhile these standard types are undergoing marked improvement that adapt them for new and amazing purposes. For instance, they make audible the heart beat of a patient during a major operation. They report dangerous strains in the masonry of big dams. They tell of the activity of machinery in great factories. 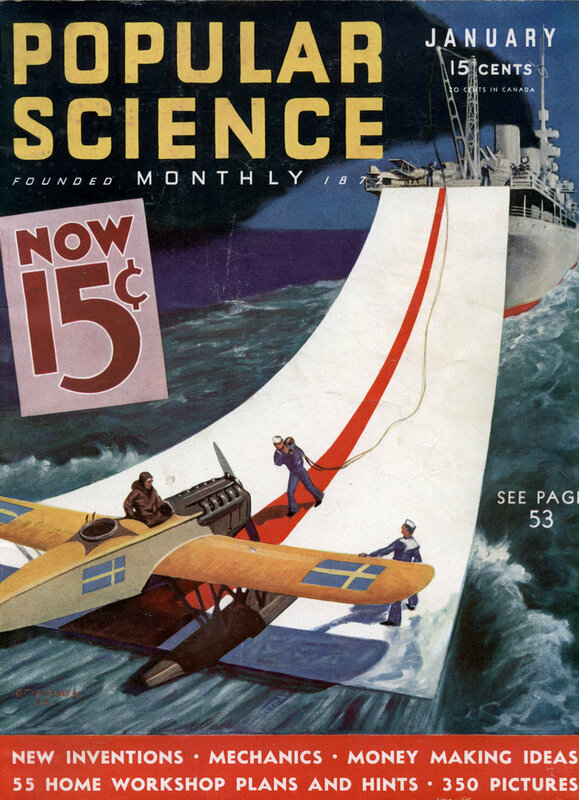 In case of war, they would warn of the approach of an enemy ship while it was still forty miles at sea. So sensitive are they, that experts listening to them, could tell whether the vessel, still far beyond the horizon, was cruiser, battleship, or harmless merchantman and in accordance with this information take the proper steps for defense.